We have specialised in bespoke printed tissue paper for the last 16 years. Over this time we have supplied printed paper to many of the best known stores around the UK and Europe. We work closely with our customers to develop long lasting relationships. Integrity and customer confidentiality are part of our service. We work hard to produce a consistent, high quality printed product, and we don’t cut corners to reduce costs. The last sheet of paper off the print machine will be the same high quality as the first sheet printed. Quality monitoring and checking are continuous, and we ensure that reprints are accurately matched for continuity. 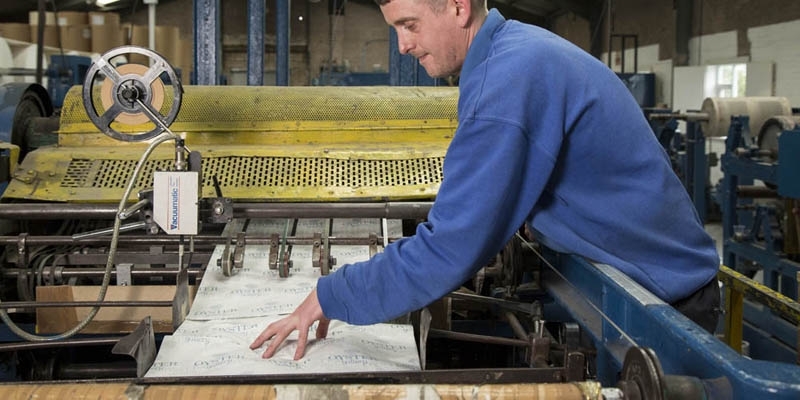 As tissue paper is no longer manufactured in the UK – Roach Bridge Paper Mill was the last surviving tissue paper mill – we source our tissue paper from mills in Europe and the Far East. Quality, consistency and environmental credentials as well as price are important factors when sourcing the paper. Printed tissue paper is an excellent addition to your branded packaging – the luxury implied by a crisp sheet of printed tissue in a parcel far outweighs the cost.